Most Americans continue to say they enjoy following the news. But the percentage saying they enjoy it “a lot,” while little changed since 2010, is significantly lower today than it was four years ago. 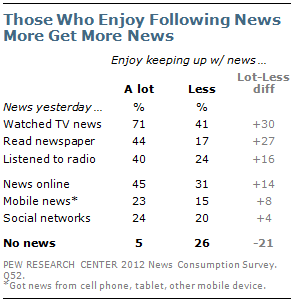 Currently, 43% say they enjoy following the news a lot. That compares with 45% two years ago and 52% in 2008, 2006 and 2004. Since 2008, there have been steep declines in the percentages of young people and liberal Democrats who say they enjoy following the news a lot. 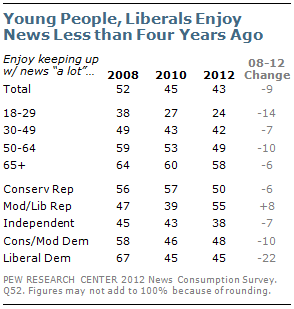 Currently, just 24% of those younger than 30 say they enjoy following the news a lot, down 14 points from 2008. There has been less change among older age groups, who continue to be more likely to say they enjoy following the news a lot. Far fewer liberal Democrats get a great deal of enjoyment from following the news than did so four years ago, during the previous presidential campaign. Just 45% of liberal Democrats say they enjoy following the news a lot; that is unchanged since 2010, but down sharply from 67% in 2008. Half of conservative Republicans say they enjoy keeping up with the news a lot. That is down from 57% in 2010 and 56% in 2008. 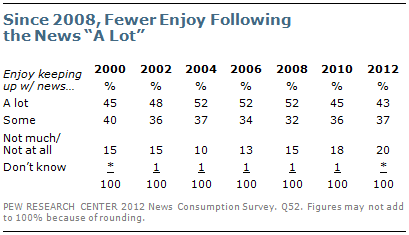 There has also been a decline in enjoyment of the news among independents, from 45% in 2008 and 43% in 2010, to 38% now. As previous news consumption surveys have found, people who enjoy following the news tend to get more news from a variety of sources. Fully 71% of those who enjoy following the news a lot watched television news yesterday, compared with just 41% of those who get less enjoyment from keeping up. And newspaper reading is much higher among those who enjoy keeping up with the news a lot than among those who do not (44% vs. 17%). People who enjoy following the news a lot also are more likely than those who enjoy it less to get news online (45% vs. 31%). But the difference is smaller in getting news from cell phones and other mobile devices. And those who get only some or little enjoyment from following the news are about as likely as those who enjoy it a lot to get news from social networks (20% vs. 24%). About a quarter (26%) of those who get only some or little enjoyment from following the news did not get any news yesterday. That compares with just 5% of those who enjoy following the news a lot. The availability of online and digital news has increased the ability of Americans to get news when they want. 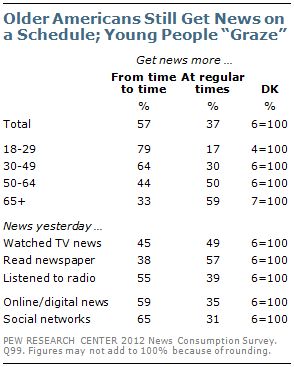 In 2010, those who check in on news from time to time, as opposed to getting it at regular times, became a clear majority. That remains the case today: 57% describe themselves as the type of person who checks in on the news from time to time compared to 37% who get news at regular times. for news from time to time, a proportion that drops to 44% for those 50 to 64 and 33% for those 65 and older. People who get news from TV or newspapers are more likely than those who get news from digital news platforms to get news at regular times. Nearly six-in-ten (57%) of those who read a newspaper yesterday and 49% of those who watched TV news say they get news at regular times. That compares with only about a third (35%) of those who got news online or digitally yesterday and 31% of those who saw news or news headlines on social networks. Despite major changes in the way Americans get news, the topics that interest people have changed very little over time. 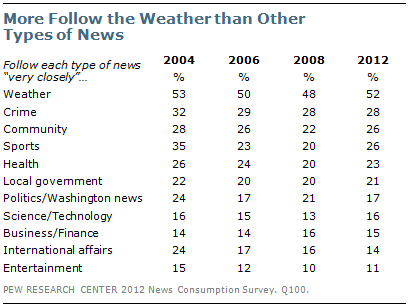 Weather continues to be the most popular news topic: 52% say they follow weather news very closely. No other type of news comes close. About a quarter say they very closely track news about crime (28%), people and events in their community (26%) and sports (26%). Other topics, including news about political figures and events in Washington (17%) and news about international affairs (14%) are less popular. There are age differences in interest in news about number of subjects, particularly political figures and events in Washington: Just 5% of those younger than 30 follow this news very closely, the lowest of any age group. 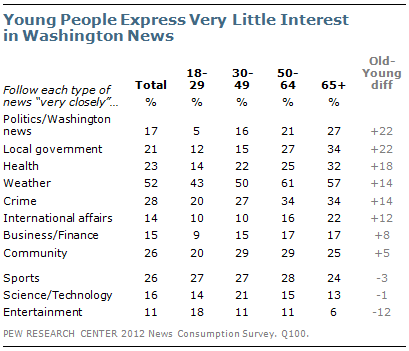 And only 43% of young people follow Washington news very or fairly closely; 57% say they follow it not too closely or not at all closely. Majorities in older age groups follow Washington news at least fairly closely. 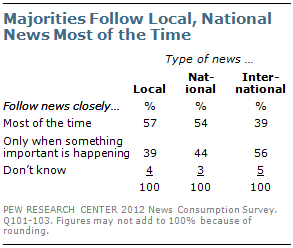 Majorities say they follow local (57%) and national news (54%) most of the time, whether or not something important is happening. But that is not the case when it comes to international news. 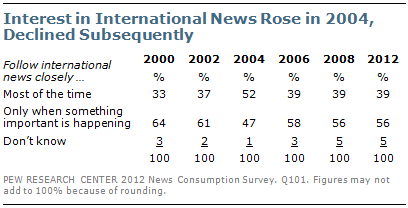 Only about four-in-ten (39%) follow overseas news most of the time, compared with 56% who follow it only when something important is happening. These views have changed little in recent years. But in 2004, 52% said they followed international news most of the time, whether or not something important was happening. That fell to 39% in 2006 and remained at that level in 2008 and in the current survey. Notably, there are large educational differences in the numbers following national news most of the time, but not international news. College graduates (69%) are far more likely than those with some college experience (53%) or those with a high school education or less (44%) to say they follow national news most of the time, regardless of whether something important is happening. But comparable percentages of all three groups say they follow international news most of the time (43% of college graduates, 40% of those with some college, 37% of those with no more than a high school education). Nearly two-thirds (64%) of the public say they prefer getting political news from sources that don’t have a particular point of view, compared with 26% who would rather get news from sources that share their political perspective. This is on par with opinions since 2006. There continue to be sizable educational differences in opinions about political news with a point of view: 75% of college graduates, and 69% of those with some college experience say they prefer political news with no point of view. That compares with 53% of those with no more than a high school education. Majorities across the political spectrum say they would rather get news with no particular point of view. Conservative Republicans are significantly more likely to express this view than they were in 2010 (58% now, 48% then). 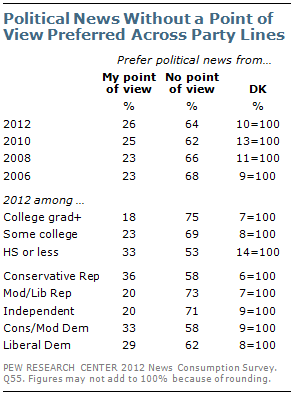 There have been more modest changes in the views of other political groups. Most Americans also continue to reject the idea that the news media are all pretty much the same. 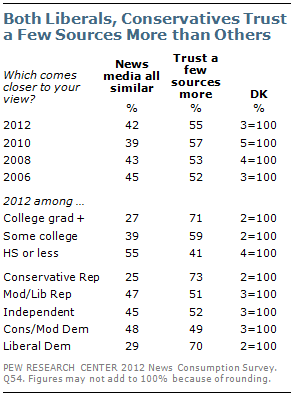 More than half (55%) say there are few news sources they trust more than others; 42% say the news media are pretty much the same. As in previous surveys, conservative Republicans and liberal Democrats are more likely than moderates and independents to say that there are a few news sources they trust more than others. About seven-in-ten conservative Republicans (73%) and liberal Democrats (70%) express this view, compared with about half of independents (52%), moderate and liberal Republicans (51%) and conservative and moderate Democrats (49%).